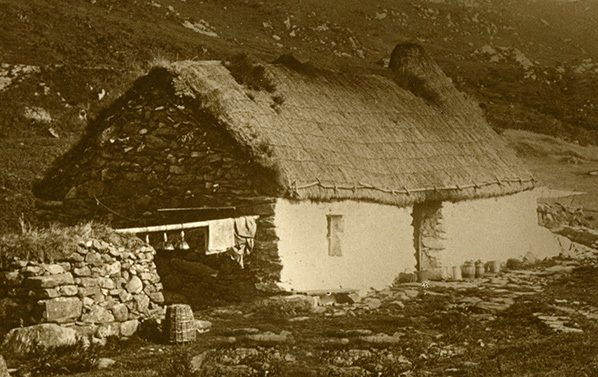 Where a roof is to be recoated and the old layers of thatch are retained as a base; then thatching crooks, wire and sways are mostly dispensed with. A much more organic type of fixing now comes into play; the wooden thatching spar, a fixing that hasn’t changed for centuries. 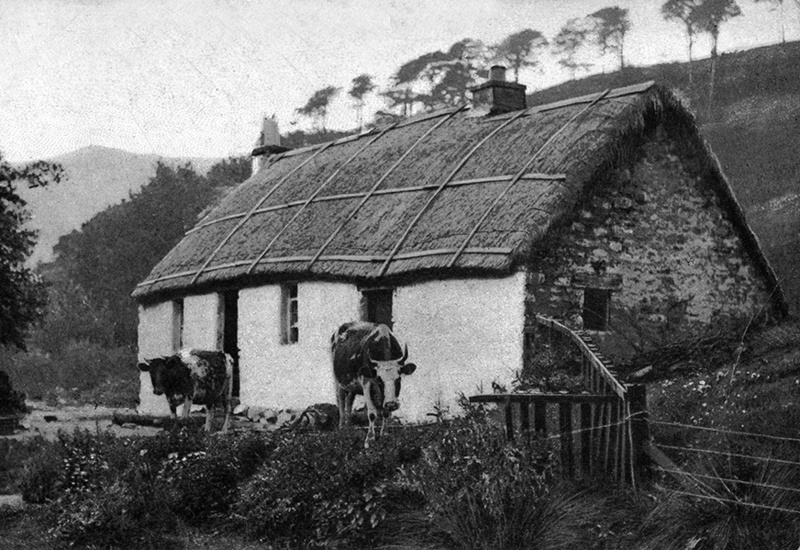 Apart from fixing a new layer of thatch to an old one, thatching spars are also used on the outside of the roof; on the ridge and around the edges of long straw work. Here the spars are used in conjunction, with longer slightly thicker, split wooden Rods, Wands or Liggers. Also, work repairing thatch often uses this type of fixing. Freshly Made… The humble, useful spar; in bundles of two hundred; sold and used by the thousand. 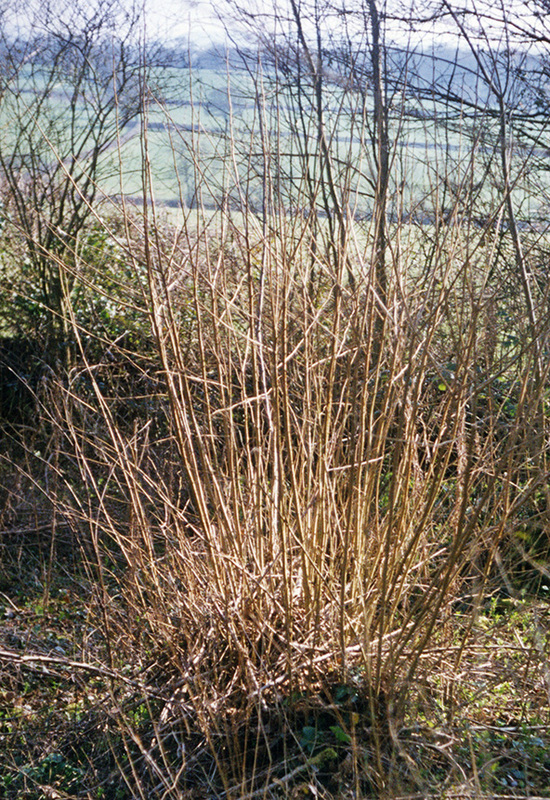 To produce suitable hazel wood for sparmaking, an existing plant is cut close to the ground in winter; the spring should see several shoots emerge and grow. After a period of seven to ten years, straight stems of a good length and suitable diameter will be ready to harvest. This regular coppicing produces large hazel stumps, known as Stools. These can consist of dozens of shoots and may be hundreds of years old. Most hazel wood, used for sparmaking, comes from ‘ancient woodland’, this being woodland that dates from before 1600. It has been said that a managed coppice supports a wider cross section of wildlife, than any other habitat. So the production of spars and other woodland products, such as hurdles; actively promotes the health of one of our most precious landscapes. 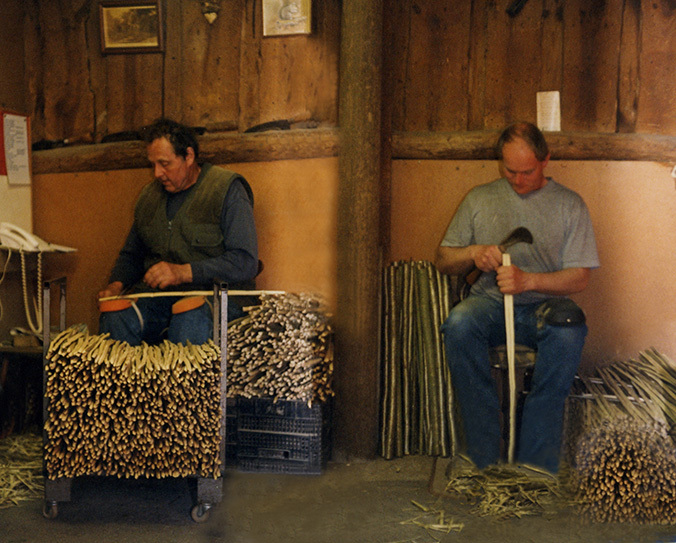 The other wood, employed in the production of spars, is willow. Much less of this is used than hazel; due to more localized growing areas. 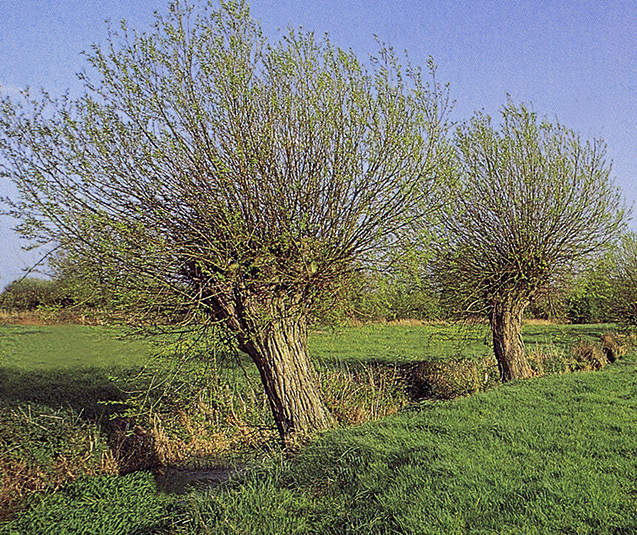 Pollarded willow trees, that have been cut around five to six feet (1.6 /1.9m) from the ground; produce new shoots, in the same way as hazel. But the growth rate is much faster. The trees can be harvested every three or four years. The trees are pollarded in this way, to stop grazing cattle eating the new shoots. Many of these trees can be seen lining the sides of drainage channels and ditches; in low lying areas throughout the country. Like water reed beds, both hazel and willow have to be cut regularly, or the stems grow too big. This overstood wood needs removing, to start the process again; an unrewarding and time consuming process. Shooting… A low cut hazel stool, in winter. And the higher shoots of a springtime willow. A couple of more years, and they will both need harvesting. Most thatchers do not make all, or any, of their own spars. And thus the production of these infinitely renewable fixings, has given rise to the craft of sparmaking. The sparmaker, on average, can produce around a hundred an hour; enough for a morning’s work, for a thatcher recoating a roof. So overall, one sparmaker can keep several thatchers working. In the past, the amount of spars required was much greater than now; as thousands were used on the farm; in thatching ricks and stacks. Many of these were made by the farm workers, in their spare time. This helped supplement some poor wages. If a group got together, around a fire made from the off cuts and chippings, that result from the process; then it could be a social occasion as well… These rick spars, could be up to 4 feet (1.2m) long. Wood, cut when the trees lie dormant in the winter; is said to give a longer lasting spar. If possible, sparmakers prefer to stop cutting in early spring, before the new leaves are ‘bigger than a mouse’s ear’. Being a natural product, the diameter of the sticks will vary. Useful sized wood is from ‘the size of your little finger to the width of your wrist.’ The sticks, when cut to length, are known as Gadds. 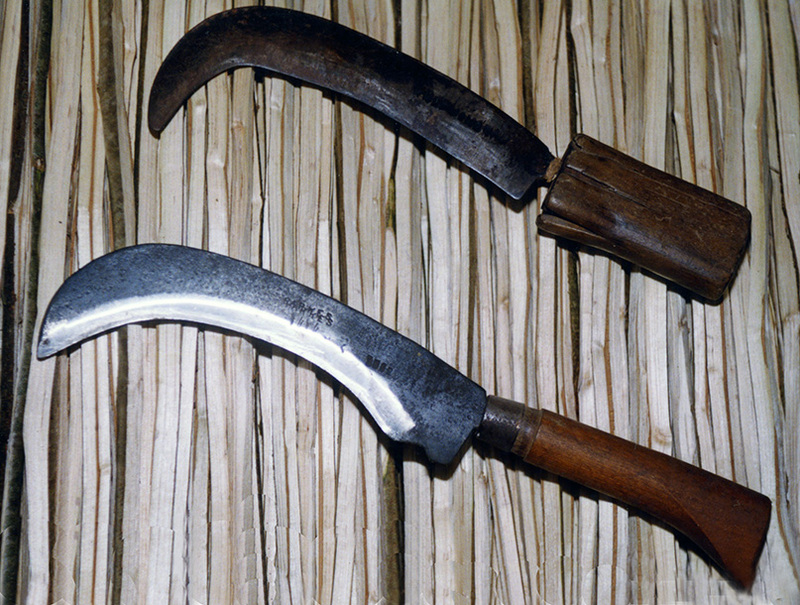 Most spars are between 2¼ and 2½ feet (680/750mm) long. The gadds are cut slightly longer, to allow for some wastage. The actual process, of spitting or Riving the gadds and then pointing the spars, varies from maker to maker. ‘With a bill hook in one hand and a leather glove …on the other, she was making spars, such as are used by thatchers, with great rapidity. She wore a leather apron for this purpose,… On her left hand lay a bundle of the straight, smooth hazel rods called spar gads, the raw material of her manufacture; on her right a heap of chips and ends the refuse… in front a pile of the finished articles. To produce them she took up each gad, looked critically at it from end to end, cut it to length, split it into four, and sharpened each of the quarters with dexterous blows, which brought it to a triangular point precisely resembling that of a bayonet’. Ideally the stick has a straight grain and splits easily, giving a constant width to the spar. But more often than not, the split needs to be brought back into line. This is done by the sparmaker applying pressure, to the back edge of the horizontal hook. A downward pressure makes the split go towards the middle of the gadd. Upward pressure will have the opposite effect. This sounds difficult and it is, to begin with. But controlling the splitting gadd is the key skill of the sparmaker. A point at each end is added, with three expert blows. Either as the spar is made or later in a separate process. Once made, the spars are bundled up, normally into two hundreds. Spars are always sold by the thousand. For far more than Marty’s pittance; but they always seem cheap, when the amount of work producing them is taken into account. Whatever the price, the thatcher needs a lot. 250 is the average, to fix the various thatching materials that cover the square of 100 sq ft (27 per sq metre). The number used on a ridge, depends on its complexity. A simple flush type may use only 25 in a foot run (80 per metre). But an ornamental block ridge, could use between 35 and 50 (120/160 per metre). Liggers are a little thicker than spars, with chisel shaped ends; and are usually around 5 ft. (1.5m) in length. Most ridges consist of two or three liggers, running horizontally along each side of the ridge. So dozens can be used, both on the ridge and to edge long straw roofs. Not long ago, thatchers could choose to have either straight or, for an extra charge, spars that were already twisted. These were useful in the summer, as they did not need to be soaked in water, as straight ones do, if they have dried out. These ready twisted spars were always in bundles of one hundred. Points inward, fifty one way fifty the other. Like splitting them, it takes practice to twist a spar correctly. With the spar held firmly in the middle with both hands, the thatcher in a single motion, twists with the strongest hand; and wraps the spar over the other hand, creating a twist wide enough to fit over a ligger or bond. This gives the ‘single twist’, used by most thatchers. They now have a springy pointed hairpin; that opens slightly after fixing, making them hard to remove. There is a variation, the ‘double twist’; where the centre of the twist is pushed out in a second motion. This gives a flatter twist, useful for ridging; as it wraps more neatly around a ligger. The ideal twist will not break too many of the spar’s sinewy fibres, as this will lessen its strength, at its most important point. 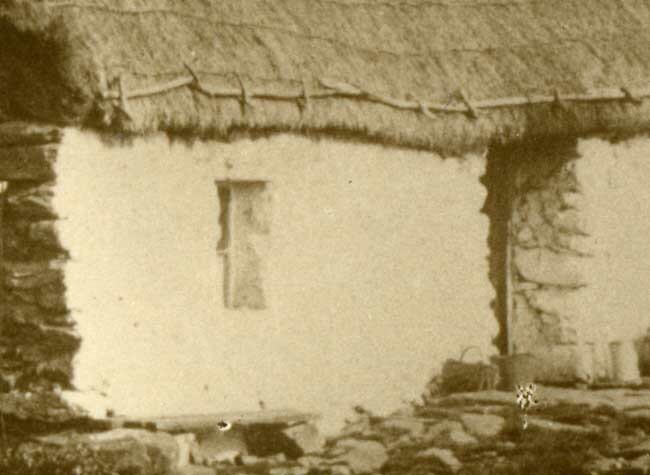 A modern development has been the moulded plastic spar, perhaps useful when fixing thatch coatwork; but far too unsightly for use on the ridge… These do not have the ‘spring’ of a freshly twisted wooden spar; that allows it to expand slightly after fixing. Giving some extra grip. In areas where hazel and willow are scarce, another type of fixing has developed. This is mostly found in Northern Scotland, and was used in parts of Wales. With this method, small branches are cut just below a fork and then shaped, with a long and a short side. The long side, often around 15 inches (375mm) in length, is then pointed. This is driven into the thatch, in the same fashion as a spar. The short end then holds down a sway or a heavier version of a ligger. 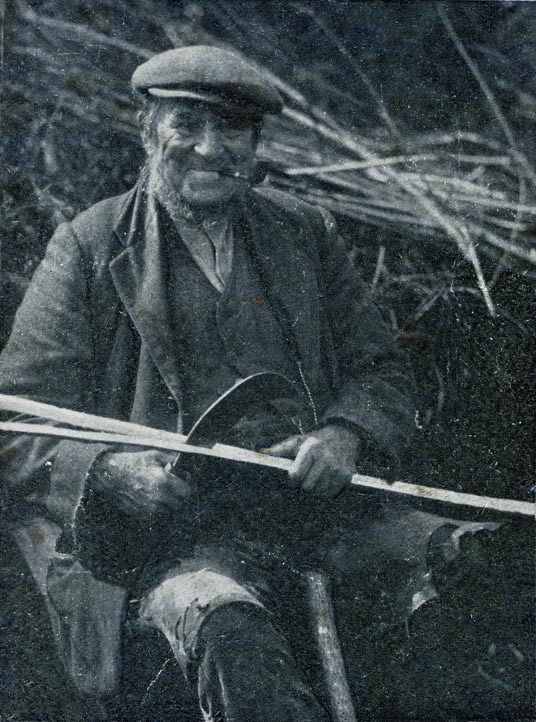 In Scotland, these are often called Cabers and the forked branch a Crook; not to be confused with the metal variety. This fixing technique is known as Crooks and Cabers. The crook needs no twisting; so any type of tree, bush or shrub will provide the raw material; making clever use, of some historically scarce resources. 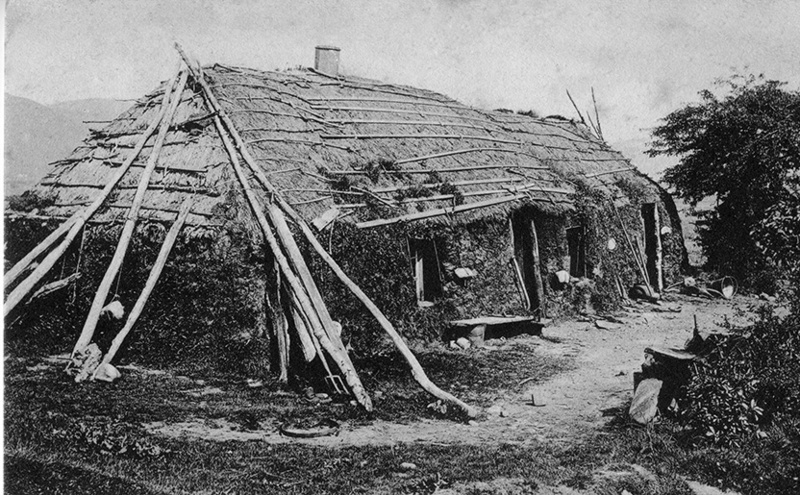 Where the wind caused problems for a thatch, and sufficient wood could be found, even bigger timbers were once used, to hold the roof covering in position. Again, this occurred mostly in parts of Scotland.